My #1 goal for our wedding cake was that it was the most delicious thing imaginable. For me, that meant three layers of chocolatey goodness: triple chocolate, German chocolate, and toffee chocolate. Delish Bakery took care of making that a reality. My #2 goal for our wedding cake was that it have skulls all over it. My mom Judy took care of making that a reality. As you can see, I met my goals. But I really can't take credit for anything but the vision. 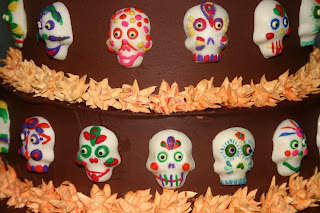 I bought the mold for these chocolate skulls from Mexican Sugar Skull, which I've talked about elsewhere. Then my mom took over, creating 60 little chocolate skull masterpieces (crafting obviously runs in the family.) She used tiny bits of fondant to uniquely decorate each one. This was truly a labor of love, because my mom HATED working with the fondant from the very beginning. Her dislike of the medium sure isn't evident in the final product, though. 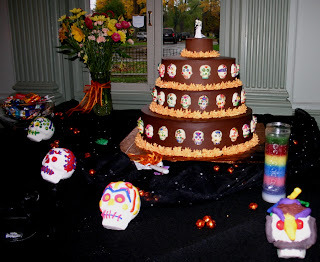 The flowers on each layer of the cake are meant to be marigolds, a flower associated with El Dia de los Muertos. 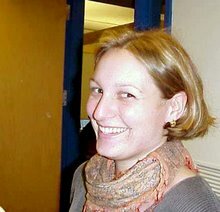 The first picture also shows some additional sugar skulls. The one on the far right was made by my husband's Uncle Charlie. He worked on it diligently for several hours one day! My sisters-in-law Ashlee and Ginny made the one that's second from the right, and I made the other two. Words don't convey the totality. Kudos to the designer and the implementor! Words don't convey the totality. Kudos to the concept, the design and the "execution", a true labor of love!